Mumbai: Venture capital (VC) put up a strong showing on Thursday with the announcement of four deals, three of them by the VC arm of the world’s largest electronic chip maker Intel Corp.
Intel Capital India announced a total investment of $23 million (Rs105 crore) in three Indian companies—July Systems Inc., KLG SystelLtd and Multi Commodity Exchange of India Ltd (MCX). July Systems also received an undisclosed amount from Sequoia Capital India in this round of fund-raising. Separately, a consortium of VC firms comprising Kleiner Perkins Caufield and Byers, Sherpalo Ventures and Reliance Venture Asset Management Ltd (RVAM) invested in Reverse Logistics Co. They did not disclose the amount of investment. Intel Capital’s investments came from its $250 million Intel Capital India Technology Fund, 60% of which has already been deployed, said Sudheer Kuppam, managing director of Intel Capital Asia Pacific. “The fund-raising environment has definitely improved," said Hitendra Chaturvedi, managing director and chief executive of Reverse Logistics, adding that his firm has got three more offers than it did in mid-2008, “when VCs were not even looking to invest". Indeed, VC investment in 2009 almost halved to 82 deals worth $444 million, down from 154 deals worth $841 million in 2008, according to Venture Intelligence, a research service focused on private equity (PE) and mergers and acquisitions. Arun Natarajan, founder and chief executive, Venture Intelligence, said that unlike VCs, which have a dedicated fund, both Intel Capital and RVAM invest from the balance sheet of the parent company, and are, therefore, not answerable to limited partners (LPs), typically, the primary investors in a fund. RVAM is the VC arm of the Reliance-Anil Dhirubhai Ambani Group, or R-Adag. “So even in a downturn, they don’t have any problem investing while the LPs of VC funds held them back from making investments in 2008 and early 2009," Natarajan told Mint. Investors have also become more confident that companies can reach their targets, said Sandeep Singhal, co-founder, Nexus Venture Partners. “Unlike last year, there is an alignment between both investors and entrepreneurs on deal terms and valuations," Singhal said. However, valuations typically go up when the markets are on a roll. “When it comes to start-ups, valuation is more of an art rather than science," said Surendra Jain, managing director of Sequoia Capital India. Higher valuations also indicate a good time for seed-stage investors to exit with good returns. For example, Mumbai Angels, which invested in Reverse Logistics in October 2008, will exit following this round of funding. “Now the VC firms are actively looking for business models which give good return, while earlier many of them followed a herd mentality and made investments," said Chaturvedi of Reverse Logistics. Markets leaders in various segments would also benefit most from renewed VC interest, said Singhal of Nexus, pointing to the range of sectors Thursday’s announcements covered. 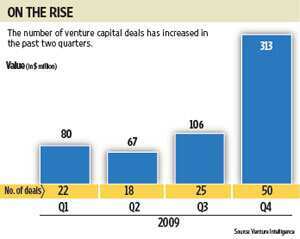 All four deals, for example, are in growth sectors that are high on the priority lists of VC firms. July Systems is in the mobile Internet space and provides services to media brands to publish, distribute and monetise inventory. KLG Systel is in the clean-technology space and provides energy management and efficiency solutions to power companies and end users. MCX is a leading commodities futures electronic exchange, while Reverse Logistics is in the reverse logistics space, moving a product from the consumer to the manufacturer, the point of origin, for reuse or disposal.